Perfectionism and Aestheticism: The All-Consuming Ballet (Paris, NY, Toronto, Chicago, CA, 1973 – 2002): The deeper meaning of the title and pink ballet ribbon wrapping Maggie Shipstead’s compact second novel unwrap, in layers, through many characters, in many places, over time, astonishing until the final act. 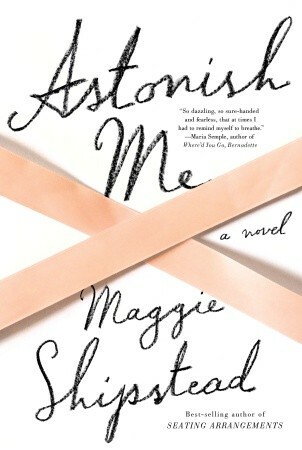 Like a ballet balance beam, the author balances the gracefulness and harshness of balletomania, “meant to look effortless, not be effortless.” Shipstead delivers a virtuoso performance by making an enmeshed story of two families, over two generations, over some thirty years, across continents, involving Russian defectors look easy! She accomplishes all this in just 253 pages, in part, by structuring her novel in concise chapters that move back and forth through time and place, creating distinct and real characters because they take us inside the grueling physical demands and the emotional/psychological consequences of living in a world always striving for perfection, and yet – no matter how much practice and pain the balletomane endures – will likely “spend a lifetime of feeling inadequate.” Perfection this precise, this astonishing is elusive. The first is she’s pregnant, which means she must forgo her life’s passion since “tininess” is all you can ever be. Joan reconciles this as not being good enough anyway – certainly not good enough to be a soloist. (She “wished for more talent, for better feet, longer arms.”) Perhaps motherhood and marriage to the brilliant, handsome, and witty Jacob who has loved her forever will be enough to make her happy. Wishful thinking when the ballet has been her life and she still looks and moves like a ballerina. Her ballet company roommate, Elaine, suffers from the same lack of confidence (“never in her life, not once, has she danced the way she wishes”), tempered by her devotion to Mr. K, the “only person who loves ballet as much as she does.” Joan may never be a famous ballet dancer but she was chosen by a very famous one, Arslan Rusakov, a star at the Kirov, to help him defect from Russia. They spent a year together at the Paris Opera House, where Sergei Diaghilev transformed the art form. Of all the Russian dancers extraordinaire, the most potent force affecting the characters in the novel is Arslan. For Joan, she is haunted by not knowing “why he chose her?” No spoilers, except to say that at the finale you’ll have the answer. The author’s handling of homosexuality stereotypes is rendered with the same balance, sensitivity, and insightfulness as elsewhere. This theme plays out in the characters of Mr. K., who both adores the “idea of women … their capacity as vessels, their aesthetics, their otherness,” and keeps his male attractions “walled off, invisible, underground, nocturnal, private;” and in Harry, whose mother does not care if he is gay, his father concerned he might be. Appreciatively, this writing is not gratuitous, instead restrained and thoughtful. I especially enjoyed the ballet prose, carefully placed throughout not to overwhelm. You don’t have to know what the ballet moves mean to sense the artistry, risk-taking, and discipline to perform them: the pas de deux, demi-pointe, ronds de jambe, plies, tendus, dégagés, fondus, frappés, développés, grand allegro, brisé volés, coupés, jetés en tournant, piqué, arabesque, chasse, sissonne ouverte, camber, adagio, battements en cloche. The ballet is the result of endless repetitions: uncounted rehearsals of acts, of scenes, of combinations, of steps. The steps themselves are only the most recent repetitions of movements he has done thousands, probably millions, of times in different rooms, on different stages, with different partners.